Ever wished you had an interior decorator in your back pocket to help you with your decorating ideas? What about a decorator who can help you visualize your decorating ideas, color schemes and DIY ideas before you make them? Most of the time, we see photos, like the one below, after all the big and small decisions have been made. This is the story of my friend Natasha, how she found an interior decorator, Shayna, in ten minutes and got great decorating ideas in two days for $10! 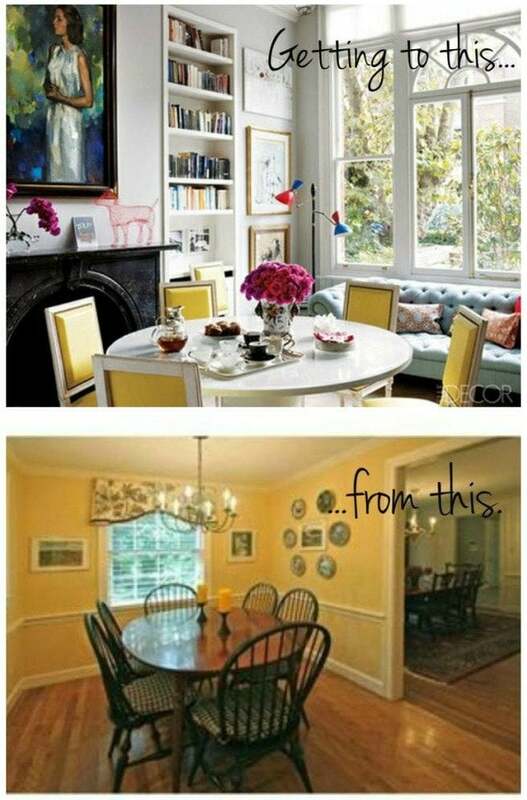 I love looking at before and after photos like the one above. Don't you? I love the possibilities, the imagination and fearlessness of some home owners. This article is about how you, like Natasha, can have your own back pocket team of designers and decorators. You'll feel like Oprah or Ellen before you know it! If you have ever wondered how some of your home decorating ideas might work in your home, had problems choosing a sofa, a paint color, adding a room, buying a lamp, creating more natural light or styling a home to sell, this is for you! I know what you're thinking; you need a few hundred, if not thousand, dollars to get decorating advice and it doesn't seem practical for a few minor questions. Let's go back a few weeks. I was having coffee with my friend Natasha, who lives in an older style apartment. School holidays were coming up and she would have two weeks to do some work around the house. Natasha needed help with her home decorating ideas, without paying an interior decorator big dollars when she really wasn't sure what she had in mind. She already had a few home decorating ideas but it was time to take action, because before she knew it, the two weeks would be over and she would be stuck with the same kitchen. 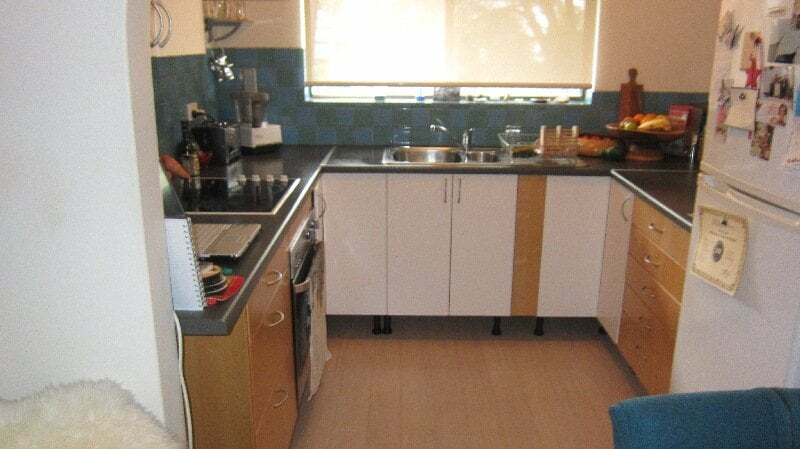 This is Natasha's old kitchen. She wondered about new tiles and cabinets. What about color schemes? 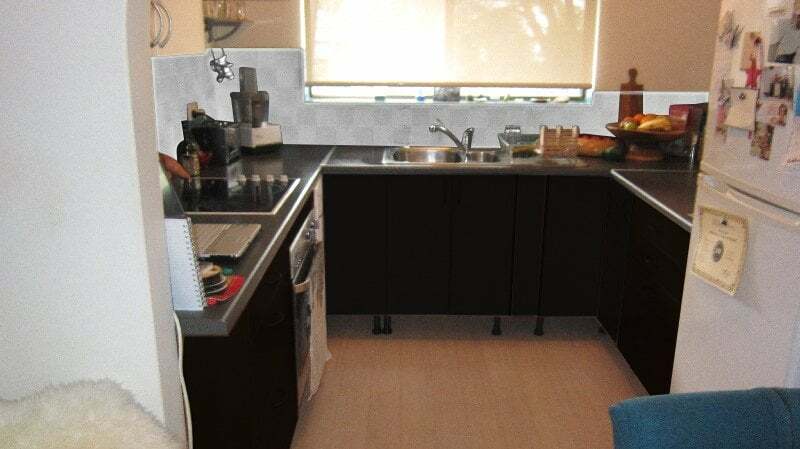 Should she get a tiler and cabinet maker in, scour Ikea or go the full DIY? Which color schemes and decorating ideas would open up her kitchen, to feel lighter and maybe even bigger? These questions can go round and round in your head until you get a head ache. Every project has to start somewhere, so I hooked Natasha up with Hop Skip Decorate, where she found Shayna, under the name SLSI. Shayna is one of the gifted people on Hop Skip Decorate and for $10 Natasha got some amazing ideas on a selection of tiles and color schemes. 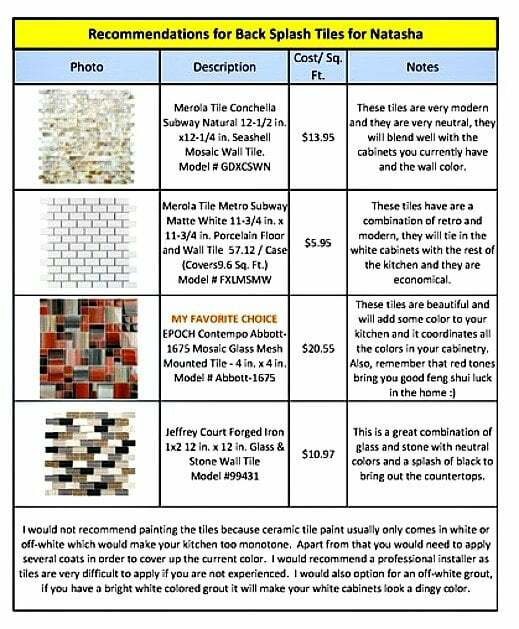 Natasha uploaded an image of her kitchen with some suggestions of what she liked and Shayna came back with an inexpensive range of tiles, with prices and why she selected them. Brilliant value and service for $10! We used another provider on Hop Skip Decorate to come up with this visual and give Natasha a better idea of what her ideas might really look like. 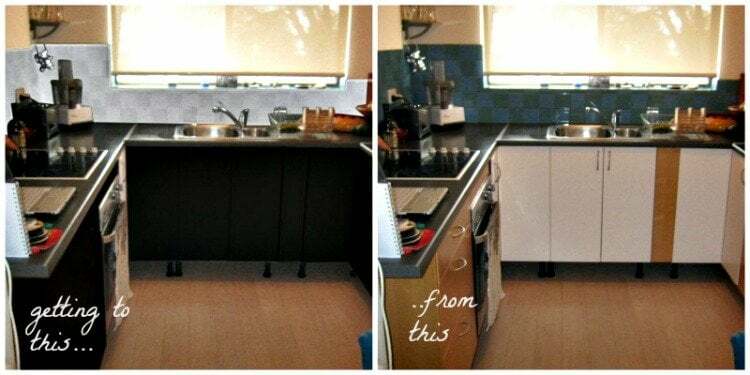 Natasha was happy to get fast, inexpensive help and by the end of two weeks, Natasha's DIY efforts had saved her a small fortune and she had a great looking kitchen. Best of all, Natasha has a better idea of what she does and doesn't like if she ever decides to install a new kitchen. 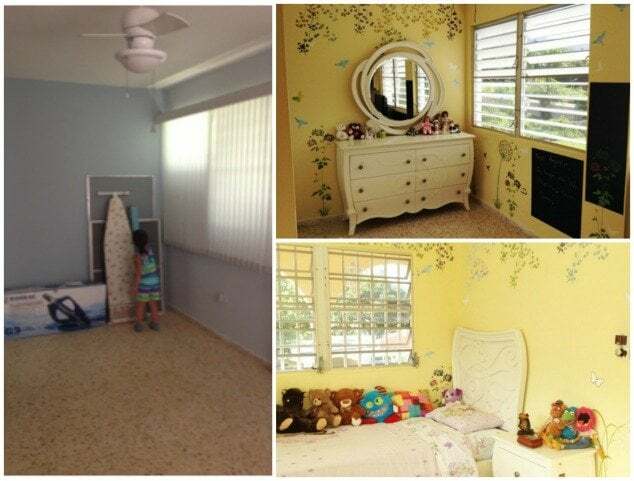 Here's Shayna's decorating ideas at work, where she transformed a child's bedroom from dank to fairy tale. 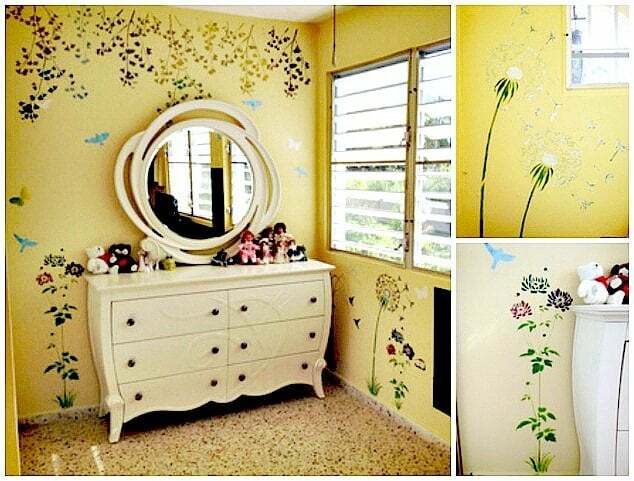 Notice her clever use of wall decals, chalkboard paint and yellow color schemes? How does it get any better than that? Here are some of Shayna's other Jigs on Hop Skip Decorate. help you select a color scheme for one room for $10. pick out bathroom or kitchen tiles for $10. answer one interior design question for $5. pick out major furniture pieces for one room for $20. tell you your best Feng Shui colors for $5. If you have an interior design question that's not on the list, contact Shayna to see if she can help you by clicking on one of her Jigs and then contact seller. Shayna is a graduate from the Interior Design B.A. program at The Art Institute of Las Vegas. Great thing is, you don't have to live in Las Vegas to get her interior design advice. She specializes in residential and worked as a design assistant for a high-end residential firm in Las Vegas, NV. Shayna's biggest passion is preserving homes because it's the best way to reduce landfill and its impact on the planet. Removing old buildings to construct new ones, contributes about 40% to landfill. So, renovating or recycling what you have while saving the planet, is something I really appreciate. I'm sure you'd agree! Below are some of Shayna's work on an existing warehouse in Bordeaux, France. That's right, way over in France; converting it into retail space for a soap store on the first level, while the owner lives on the second level. The building was saved from being destroyed, while keeping as many as the original elements as possible. Recycling at its best. Whether you need a little styling advice, or some design advice, you can see Shayna's profile and decorating Jigs at Hop Skip Decorate under SLSI. 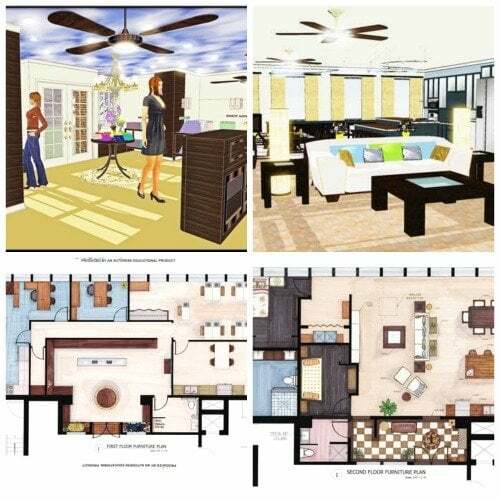 I love the idea of having access to an interior decorator who can help you visualize your interior design, color schemes and DIY ideas online, within a few days. Hop Skip Decorate is owned by Decorated Life, because amazing designs should be accessible and affordable by everyone! It's still in its infancy with more providers joining each day. If you have any suggestions, I'd love to hear them. If you would like to join our email list, you can sign up here for more free decorating ideas or look below for more interior decorating articles.